Some Recent Painting | H.A.W.K.S. Following my string of defeats in Dragon Rampant (DR) at Huzzah, I decided it was time to add a new unit to the mix. DR calls for 6 figure cavalry or war beast stands. 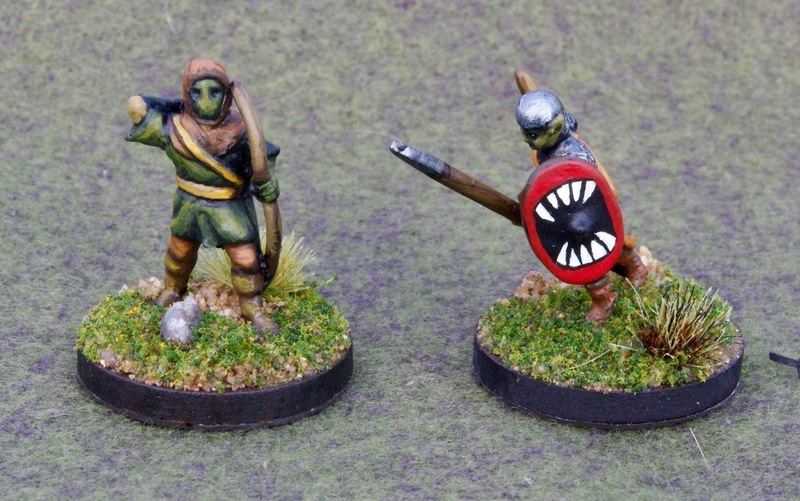 I had wanted to do some giant rats in Iron Wind/Ral Partha, so I’d bought enough for six bases some time ago. They have been sitting around primed, but otherwise untouched, for a few months, and this was their week. These two veteran Minifigs are destined to be part of the upcoming ME war bands project. The Ithilien ranger (ME34) is an eBay acquisition, but the heavy goblin (ME56) was handed to me by my brother (one of seven), and is one that’s been in the combined family collection for 40+ years. I took my travel paint kit and half a dozen miniatures on my most recent business trip, a week before Huzzah. 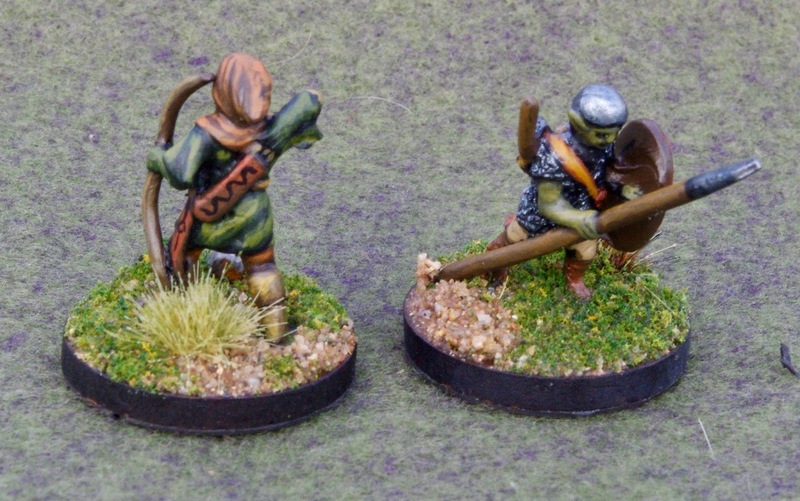 My actual painting time turned out to be somewhat limited, but I finished these two Heritage figures. The Boromir (movie version, catalog number 1750) is a Mike Thomas/Classic Miniatures recast, and completes (finally) my Fellowship. I think it’s been about two years since I bought them from Mike. 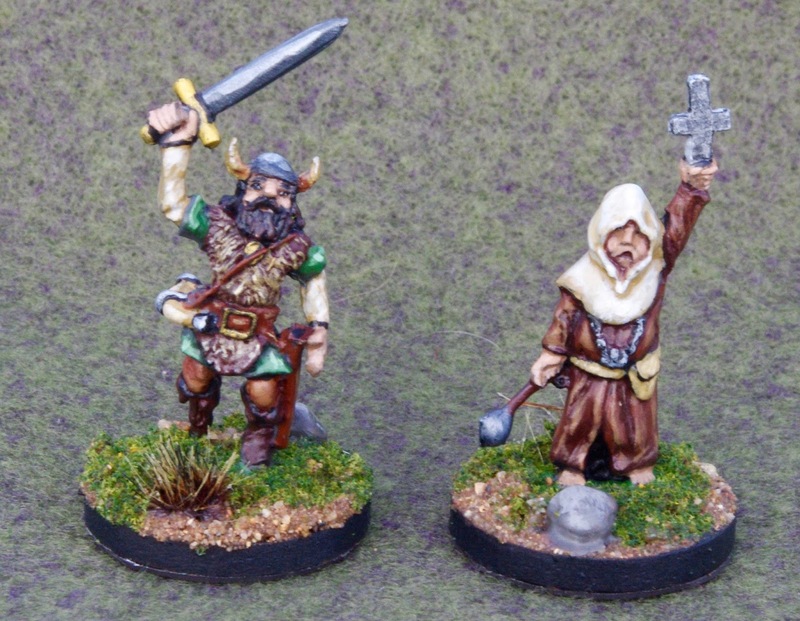 The cleric is from a package of four expansion figures for the TSR boardgames Dungeon, based, I believe, on an article in a Strategic Review or Dragon. (The expansion, that is…) He drifted in as part of an eBay lot with a lot of nice (and unusual) Heritage stuff early in my eBay obsession, so also almost two years ago. That puts me at 5 bases of “Cold Islanders” for the campaign, so I hope to get back to painting more of them soon.